From the hearth to the crown, and everything in between, count on Santa's Chimney Sweeps to clean every inch of your fireplace and chimney. Not only do we reach the visible spots, but we also get into those hard to reach places where most chimney fires originate. Keep your fireplace from turning into a fire hazard when you hire us to repair your fireplace and chimney. From preventative maintenance, fireplace inspection and cleaning to complete reconstructions, let us restore it to its former beauty and remind you of why you fell in love with your home in the first place. 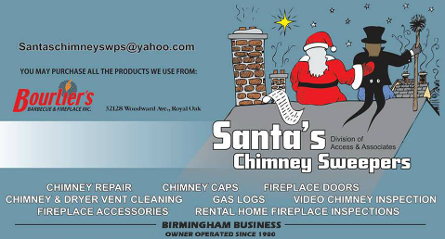 Santa's Chimney Sweeps in Birmingham, Michigan, has provided comprehensive chimney cleaning and maintenance services to residential clients since 1980. Backed by more than three decades of experience, our fully insured team of fireplace and chimney maintenance contractors has the equipment, skill, and knowledge to tackle any job with efficacy and with minimal invasiveness to the client. We are a safety-first company dedicated to providing quality service at an affordable rate. Furthermore, we take the time to answer your questions and educate you on proper chimney care. Whether you are getting your home ready for the market or the holidays, you can count on Santa's Chimney Sweeps.